"My head runs all upon the works of God in nature. It is through that telescope I see God in his glory." 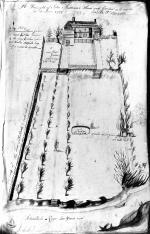 Line drawing of his house and garden by John Bartram, 1758. The John Bartram House, Philadelphia, PA, circa 1910. In the decades following the establishment of Penn's colony, Europeans became fascinated with the strange and exotic species hidden in the endless woods of North America. There were squirrels that flew, frogs that croaked so loudly that two people talking side by side could not hear themselves, swarms of insects that could drive a person insane, a thousand flowers never seen in the whole of England and a thousand other wonders, real and imagined. In the decades before the American Revolution, amateur naturalists took to the woods to gather seeds, insects and cuttings. First among them was John Bartram, a plain-mannered Quaker farmer who had carved out his farm on the banks of the Schuylkill River just a few miles outside Philadelphia. There he drained his wet riverfront meadows, planted his crops and turned a five-acre plot of land into the most famous and important botanical garden in the New World. Since the age of ten, Bartram had, as he wrote to a friend, "a great inclination to plants, and knew all that I once observed by sight." 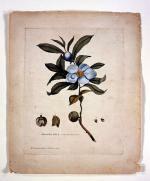 Bartram began his botanical explorations in 1727. When not farming, he explored the woods in search of plants for his garden. Soon he was sending seeds, bulbs and cuttings of the plants he found in the great forests of North America to collectors in Europe. Wandering the forests alone, he followed Indian paths from Florida to Canada, looking for new flowers and seedpods he could take back to his farm. To collectors in Europe he sent witch hazel and sugar maple, bittersweet and white cedar, buttonbush and mayflower, sand myrtle and white ossier, tulip cones and hornbeam. 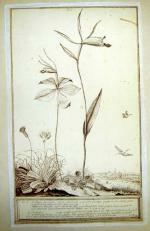 Rosebud Orchid [Plate 12 in Catalogue], by William Bartram, 1791. 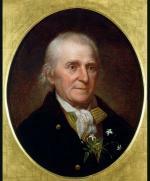 William Bartram, by Charles Willson Peale, from life, 1808. When Bartram began his collecting, only about 300 of the 8,000 species of flora native to eastern North America had been introduced to Europe. He would introduce another 150 to 200, about half the total exported during those years. Exploring with his son William (1739-1823) along the Altamaha River in Georgia, Bartram came across a flowering tree with large, snow-white flowers "of the first order for beauty and fragrance of blossoms." Several years later, William would return and save the Franklinia – named in honor of family friend Benjamin Franklin – from extinction. To the Quaker Bartram, Penn's woods were more than a warehouse of wealth or scene for adventures. Wandering the "grand and spacious temple" of nature provided him endless encounters with the God of Creation. Through pious contemplation of nature, he could see the divine wisdom of "the Grand Giver and Supporter of universal life." Bartram's scientific observations emerged from his reverent contemplation of God's hand in nature. Bartram never had much of a formal education, so he lacked the scientific knowledge of many of the other great botanists of his age. But through careful observation, he became the first botanist to identify the reproductive structures of plants. The great Swedish biologist Linneaus – inventor of the system of plant classification that we still use today – was so impressed that he called the humble Quaker farmer "the greatest natural botanist in the world." When Bartram died in 1777, much of Penn's woods were still unexplored by Euro-Americans. But Bartram's attitude of quiet contemplation and unobtrusive collecting was not to last. Future generations would be attracted less by evidence of God's majestic hand upon nature than by the desire to convert nature's bounty into capital and profit, as quickly as possible. Thomas Hallock and Nancy Hoffman, William Bartram, The Search for Nature's Design: Selected Art, Letters, and Unpublished Writings (Athens, GA: University of Georgia Press), 2010. Joseph Kastner, A Species of Eternity (New York: Knopf), 1977. Thomas Slaughter, The Natures of John and William Bartram (New York: Alfred Knopf), 1996.